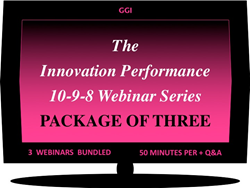 GGI Introduces New Webinar Programs on Innovation Productivity -- Starting With "The Innovation Performance 10-9-8 Webinar Series"
If you are looking for content without spin, and knowledge that can be put to practical use, our educational webinars will not disappoint. Beginning in the summer of 2018, GGI will launch a series of individual and bundled webinar programs that provide a convenient alternative to traveling to participate in our in-person Summits and Masterclasses. GGI's inaugural webinar offerings will be on three subjects: Breakthrough Innovation, Innovation KPIs, and Innovation Best Practices. On the third Thursday of July, August, and September 2018, please consider joining us at 2:00 PM Eastern Time for a one hour synthesis of these three important innovation productivity areas. Each webinar will present the essence of the subject matter on the topic; and provide complete references, citations, and additional sources of information so participants can dive deeper into any specific topic where they wish further information. One may register for individual webinars, or bundle them for a significant discount. Away from the office on the day of the webinar? There is an option to obtain the recordings for viewing at a convenient time. This webinar focuses on nine Key Performance Indicators (KPIs) that together capture the lion's share of overall innovation performance. These nine KPIs span investment levels, innovation levels, execution ability, productivity, and overall business performance. Founded in 1986, GGI has consulted to over 200 medium and large companies. Some 500 companies have participated in GGI's educational events. Since 1998 the company has performed primary and secondary research on R&D, product development, innovation, and metrics. With several hundred published articles and research reports, and an equal number of public and conference presentations, GGI is well qualified to offer value-added one-hour webinars to corporate innovation leaders and practitioners. Brad Goldense, GGI's President and webinar presenter, taught practicing managers and executives for nineteen years in the Masters in Engineering Management program at The Gordon Institute of Tufts University weekend graduate-level program. Mr. Goldense, an engineer and MBA with four technical certifications and forty-years of experience, is proficient in disseminating practical knowledge and insights to professionals who are responsible for strategy and bottom-line performance. For the past five years, Mr. Goldense has written "Goldense on R&D-Product Development," the inside back page article on engineering strategy and management for Informa's monthly Machine Design magazine. He is a frequent speaker at the International Forum on Design for Manufacture and Assembly for three decades, and at the R&D 100 Conference that is held in conjunction with the R&D 100 Awards each year. Brad is a member of the judging panel for Design World's Leadership in Engineering Achievement Program - LEAP Awards.